William BARNES (1613 – 1697) was Alex’s 10th Great Grandfather, one of 2,048 in this generation of the Shaw line. William Barnes was born in 1613 in England. His parents were Thomas BARNES and Mary ANDREWS. He married Rachel [LORD] in 1637 in Amesbury, Essex, Mass. William died 14 Mar 1697 in Salisbury, Essex, Mass. Rachel [Lord] was born about 1617 in England. Her parents may have been Anthony LORD and Katherine THOMPSON. 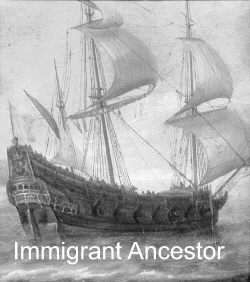 Rachel’s identify isn’t known for sure, early genealogists didn’t include a family name. Others say her maiden name is Lord because her mother was named Grace Lord from a previous marriage or that she is Rachel Fitts, sister to Robert Fitts. Rachel died 9 Feb 1686 in Salisbury, Essex, Mass. 2 Oct 1665 Salisbury, Essex, Mass. 27 May 1688 Amesbury, Essex, Mass. William was a house carpenter. William Barnes was one of the original settlers of Salisbury, Mass. At the first division of land, he received a house lot and a planting lot of four acres. In Jan., 1640-41, he received the “Rockie Island” in the meadow, and other grants. On the list of freemen contained in the Mass.. Records, under date of June 2, 1641, we find the name of William Barnes, in connection with two or three other Salisbury names. He was one of those who removed to the west side of the Powow River , and settled that part of the town afterwards called Amesbury. On the Amesbury records he is frequently mentioned as constable, moderator, &c. His name also occurs several times on the Old Norfolk records, as juror, one of the “commission” to end small causes” in Amesbury, &c. His grants of land in the new town correspond very nearly ID member and amount with those of John HOYT . His trade was that of a house carpenter. Wife Rachel died Feb. 9, 1685-6. He died March 14, 1697-8. Will dated April 7, 1696, proved Sep. 28, 1698. His homestead was bequeathed to his daughter, Rebecca Morrill. Rachel, 30 Apr. 1649, wh. m. 2 Mar. 1668 or 9 (both dates being giv. ), Thomas Sargent; Sarah, wh. m. 8 Sept. 1670, Thomas Rowell, and next, 26 Oct. 1676, John, or more prob. Thomas Harvey, as the Amesbury rec. gives the name; and Rebecca, wh. m. Moses Morrill. Deborah m. 19 Dec. 1663, Samuel Davis. 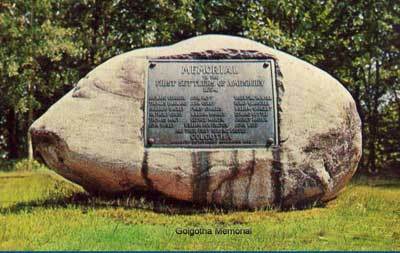 He was one of the first settlers of Amesbury a. 1654. It has been thought that he is the man in the list of passengers by the Globe from London for Virginia, 1635, and the names of William Brown, and Richard Wells in the same list are seen, both, also, found at Salisbury. But those surnames are so frequent on both sides of the ocean, that the argument must not be pressed too far. Some persons might, at that time, think it easy to go from one part of America to another; but most of those for Virginia were not puritans, and all wh. would come to New England especially from London, easily gained direct, instead of circuitous passage. Of this name, includ. those spelt without e, Farmer, in 1834, count. seven gr. at Yale, five at Harv. and five at other N. E. coll. 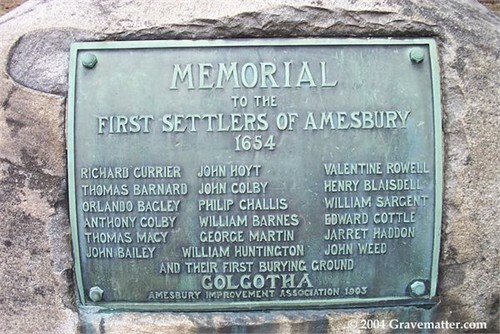 Settled in 1642, Amesbury was first recognized as “Salisbury New Town” in 1666 when it formally separated from Salisbury. It was incorporated as “Amesbury” in 1668, after Amesbury in Wiltshire, England. Originally the boundary between Amesbury and Salisbury was the Powwow River. In 1876 Merrimac was created out of West Amesbury. In 1886 West Salisbury was annexed to Amesbury so the mill area on the Powwow River was unified. See the maps linked below. Beginning as a modest farming community, it would develop an aggressive maritime and industrial economy. The 90 foot drop in the falls of the Powwow River provided water power for sawmills and gristmills. Shipbuilding,shipping and fishing were also important. The ferry across the Merrimack River to Newburyport was a lively business until the construction of bridges to Deer Island. 4 Nov 1658 – whereas there is a saw mill in possession of Wm Osgood, Phil Challis, William BARNES, Anthony COLBY and Samuel Worcester, co-partners with said Colby in one-fourth part of the mill in Salisbury upon Pawwaws river near the corn mill, they should keep it in good working order, and agreed to make good to Wm Osgood the grant of the town; the timber to be equally divided among them and each partner to have the privilege of using the mill for sawing his own timber into boards or planks to be used only on the land where said Osgood now dwells for building or repairing, provided they bring the timber to the mill already cut; if any one of them makes a new way to any parcel of timber, the others were to pay part of the cost if they used said way; if any one of them cleared the river for floating down logs to the saw mill, the others should bear part of the charge if they used the river for this purpose, etc; each partner was to be allowed 3s per day for what time he gave to repairs on the mill, if he be a good workman, and 4s per day for making the head block and 3s per day for a hinder head block and 2s 6d for a wallower or sweep; each partner was to provide saws for himself and the saws now at the mill to be equally divided, except those for oak; each partner was to take the mill to run for a week and so in order through the year, William Osgood beginning, followed by Colby, Worcester, Barnes and Challis in order; each was to lay his boards and logs at the mill where they had formerly. Witnesses: Thomas Bradbury, Humphrey Verney, Rodger Easman and Jno HOYT. He received, land in A. 1658-66 ; ” children’s land ” and taxed 1659 ; ” townsman ” 1660 ; oath fid. and meeting-house seat 1667 ; oath al. Dec, 1677 ; kept “ordinary ” for A. 1667-9. 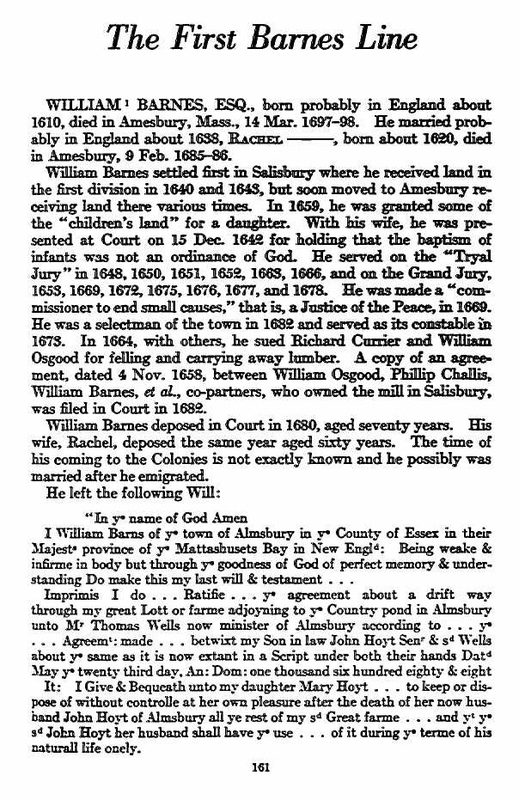 Oct 1658 – He received his first lot of land (“on the river”) in Amesbury, and was admitted as a “townsman”, Dec 10, 1660. Among other lots which he received were one in “Lion’s Mouth,” 26 Feb 1661 and a lot of 120 acres, April, 1662. One of his earliest purchases consisted of five acres of upland at the “southermost end of Tom: Whitchers hill,” bought of Edward Cottell in 1660. It is difficult to dertermine the location of his homestead. John Hoyt’s father John was on the grand jury in 1667, and a John Hoyt,probably the same one, was also one of the grand jury in 1663. 13, 2m, 1669, he was also licensed “to keep ye ordinary for Amsbury for ye yeare ensuing.” He took “ye oath of Alleiance fidelity” before Major Robert Pike in “Eamsbery,” Dec. 20, 1677. He is also frequently mentioned as a juror, on the Old Norfolk records. John Hoyt always signed his own name in full, and evidently had a pretty good education for a common man of those times. In old deeds (of which he gave and received a large number), he is sometimes called a ” planter,” and sometimes a “carpenter.” He and his father sold buildings and land to the town for the use of the ministry, soon after Amesbury was incorporated. 9 Jul 1667 – He had a seat assigned him in the meeting house. “To the honble their majties Great and Generall Court of the Province of the Massachusetts Bay in New England, now sitting in Boston by ad.journem`, March 6th, 1694/95. Humbly Sheweth, that yor Petitionr is now in Prison undr an Execution for the Non. satisfaction of the arrcares of the rates comitted to him to collect whitest he was Constable of Amesbury. That Your Petitiont has Lately mett with great losses, haveing had his house plundered by the Indians, and has been visited with much sickness through the holy afflicting hand of god upon him–besides sundry of the persons from whome many of sd arreares be due are both dead & removed out of ye Towne. Now For asmuch as yor poore petitions by the providence of God is reduced to a necessitous condition, and wholelv uncapacitated, by reason of his confinemt, to doo any thing for himself & family or ye paymt of sd arreares for ye prsent, he therefore humbly entreates the favour of this high & honble Court to Consider the premisses, by being pleased to grant unto him two or three yeares space for paymt thereof; as also for areleasemt from his confinemt. “And yor petitionr as in duty bound shall Ever pray, &c.
“Essex sc. By ye Honble Barth Gedney Esq~ Judge of probate of Wills &c for sd County august 9th 1697. “An Inuentory of the Estate of John Hoyt of Almsbury deed. Apprizcd as mony Nouembr 5th 1697 p vs whose names are under written. mony Nouembr 5th 1697 p vs whose names are under written. Deborah’s husband Samuel Davis was born 26 Nov 1640, Haverhill, Mass. His parents were James DAVIS and Cicely THAYER. 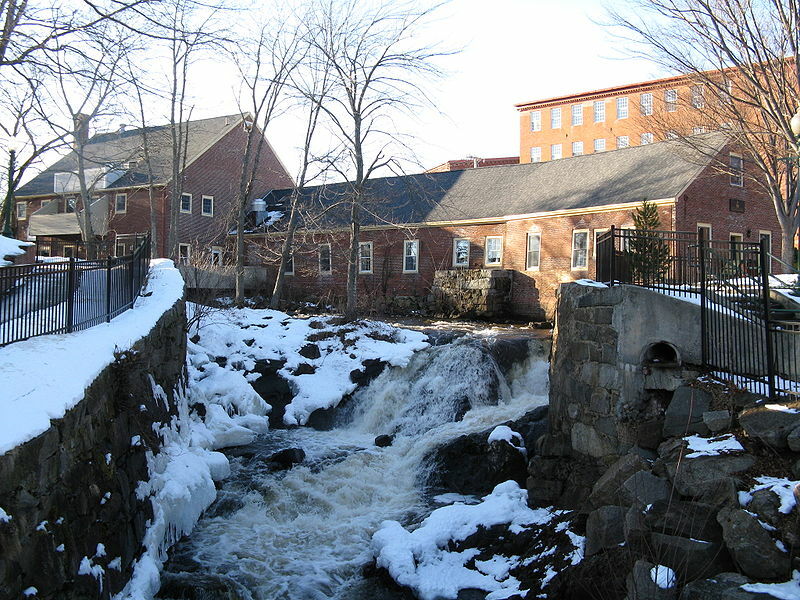 Samuel died 10 Sep 1696 in Haverhill, Mass. Thomas was a farmer and lived on Bear Hill. He took the oath of allegiance and fidelity at Amesbury before Major Robert Pike, December 20, 1677. He held various town offices and as lieutenant of the militia company. He was on of the most prominent men of his day in Amesbury. His will was dated February 8, 1706, and proved at Salem, April 8, 1706. It was signed Thomas Sargent and named his wife, five sons and the four daughters then living. Sarah’s first husband Thomas Rowell was born 7 Sep 1644 in Salisbury, Essex, Mass. His parents were Valentine Rowell and Ann Currier. 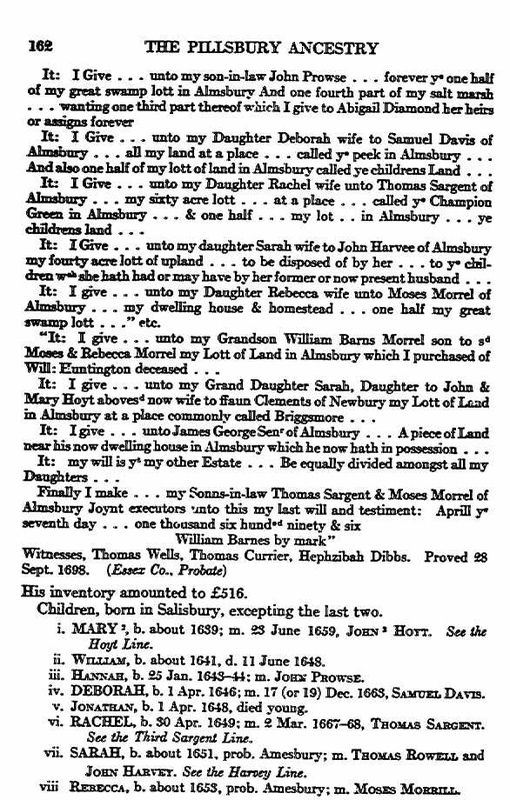 Thomas died 8 Sep 1670 in Amesbury, Essex, Mass. Of Amesbury, MA. Received children’s land 1659, township 1660, meeting-house seet 1667, Oath of Allegiance 1677, signed petitions of 1680. Will made 6 May & 30 Sep 1684. Rebecca’s husband Moses Morrill was born 28 Dec 1655 in Salisbury, Essex, Mass. His parents were Abraham Morrill and Sarah Clement. Moses died 20 May 1731 in Salisbury, Essex, Mass. This entry was posted in 12th Generation, Historical Monument, Immigrant - England, Line - Shaw, Pioneer and tagged Amesbury, Amesbury Pioneer. Bookmark the permalink. How did you resolve the question as to the name of William Barnes’ wife Rachel? (1) Some say her maiden name is Lord, whose mother was named Grace Lord from a previous marriage. (2) Others say she is Rachel Fitts, sister to Robert Fitts. (3) She is the daughter of Anthony Lord and Katherine Thompson, as you have on your site. I don’t have any special insight about Rachel’s origins. Early genealogists, such as Savage, didn’t include a maiden name and I haven’t seen any reference to original documents. I’m guessing all three theories are conjecture. I updated the page to be consistent with the uncertainty. Coat of Arms removed. In reality, William Barnes was not part of the gentry and did not have a coat of arms when he came to America. William Barnes, son of Thomas, was Christened 07 NOV 1613 at SAINT DUNSTAN IN THE EAST,LONDON,LONDON,ENGLAND (https://familysearch.org/ark:/61903/1:1:NP1C-NZ1 : 11 February 2018, William Barnes, 07 Nov 1613); citing , index based upon data collected by the Genealogical Society of Utah, Salt Lake City; FHL microfilm 845,247.